In summary: things are getting less promising for 2H 2018 growth in world’s largest emerging and middle-income economies. Brazil Services PMI posted second consecutive quarter of contraction in 3Q 2018, falling from 48.8 in 2Q 2018 to 47.9 in 3Q 2018. Since 3Q 2014, Brazil’s Services PMIs posted readings below 50.0 mark (zero growth mark) in all, but one quarter (1Q 2018 when the PMI was at 51.0). Importantly, 3Q reading was statistically significantly below 50.0 mark. Russia Services PMI fell marginally from 54.0 in 2Q 2018 to 53.6 in 3Q 2018, signalling weaker, but statistically-speaking, still positive growth. PMIs fell in all three last quarters from the 4-quarters peak of 56.0 in 4Q 2017. Q3 2018 was the lowest growth reading in 9 consecutive quarters. 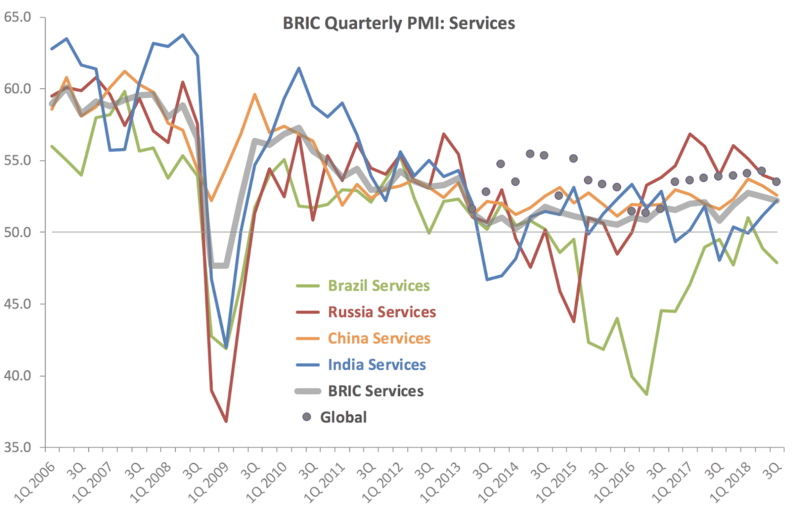 Despite this, Russia Service sector growth signalled by the PMIs is the fastest of all BRIC economies. China Services PMI also fell to 52.6 in 3Q 2018 compared to 53.2 in 1Q 2018, marking the third consecutive decline in PMIs. China posted the second highest rate of growth in Services sectors amongst the BRIC economies. India Services PMI rose, breaking the BRIC trend, in 3Q 2018 to 52.2 (weak growth) from 51.2 in 2Q 2018, marking the second consecutive quarter of above-50 readings. This marks the strongest growth signal in 8 quarters, albeit the level of PMI is anaemic. Overall BRIC Services PMI computed by myself based on Markit data and global economy weights for BRIC countries, has moderated from 52.5 in 2Q 2018 to 52.2 in 3Q 2018, suggesting weakening growth momentum in the Services sector of the BRIC economies. This development was in line with the Global Services PMI movements (down from 54.2 in 2Q 2018 to 53.5 in 3Q 2018). For BRICs, Services PMI is now at the lowest reading in three quarters, and for the Global Services PMI – in 7 consecutive quarters. All BRIC economies Services sectors are now trailing (Brazil, India and China) or barely matching (Russia at 0.1 points higher) the Global Services PMI.